As I’m preparing for my ever-closer-to-reality thru hike, I find myself being asked constantly, “Why?” Well. All sorts of reasons come to mind, many of which are listed in my Appalachian Trials lists. A few of those reasons are to lose weight/get in better shape, see parts of my country I’ve never seen before, test my physical and emotional limits, meet like-minded people, decrompress from 8 years of college and part time jobs, gain new skills… I could go on. But all of this wondering why got me thinking about the draw of humans to the concept of the pilgrimage. I’m only one of thousands that attempt the Apalachian Trail, PacificCrest Trail, or Continental Divide Trail, in addition to many countless shorter trails each year as thru hikers. And that’s just in North America. The pilgrimage has a long history in Europe, and I decided to look into it to see if I could find some information that might enlighten some of these folks asking “why”. The idea of a religious pilgrimage spurred the organization of arguably the most famous pilgrimage of all times, the Crusades. The Crusades were a call for faithful Christians to participate in an armed pilgrimage, for which they would receive forgiveness of their sins due to the hardships to be faced along the way. These people were again looking to cleanse their religious palates by partaking in a long, difficult journey. This one just happened to turn into a bloody nightmare. Religion was even the driving factor behind the great pilgrimage that brought Europeans to America. Settlers sought religious freedom and a new life, so they made the difficult journey across the sea to look for a new world. Where does that bring us? After the crusades, the pilgrimage fell out of fashion with the church, but the notion of taking a long journey has stuck through the centuries and is still very prominent today. In the late 1800’s, more than 70,000 Mormans set out to walk 1,300 miles from Illinois to Utah in search of a new place to practice their religion. In 1930, Ghandi and a group of 78 followers set out to march 248 miles to protest British rule of India. More than 100,000 people set out each year on the 450 mile Camino de Santiago, which runs through Spain and France. The Char Dham in India is a nearly 4,000 mile journey to the 4 sacred places of India. There are about 30 National Scenic Trails or National Historic Trails in the US alone, with most of them being over 1,000 miles. THIS website has a great list of trails in the US if anyone happens to be interested in planning a pilgrimage of their own, but perhaps isn’t quite ready to commit to something as long term and long distance as the AT. As these examples indicate, people are drawn to travel long distances for various reasons: spiritual voyages, protests, freedom, enlightenment. 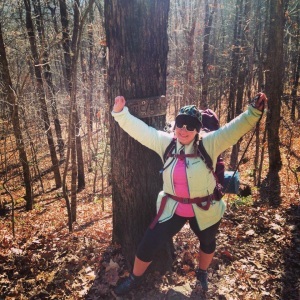 It seems to be human nature to take a pilgrimage for one reason or another, and I guess that’s why thousands of people set out to hike the Appalachian Trail each year. We all have our own reasons, but we all share one human desire: to walk and push ourselves beyond our known limits. I think this quote by T.S. Eliot describes well what happens when one embarks on a long journey: you return renewed and changed from what you were before, and the place you return to is inevitably different than when you left. I’ve been on a few more shakedown hikes. 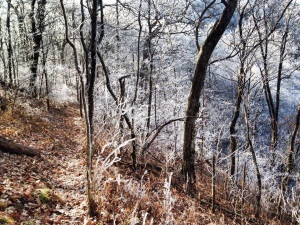 In my last post I included a few photos from my overnight from Wayah Bald to Winding Stair Gap. I camped on Siler Bald in my hammock. It was about 30-32 degrees overnight. I decided to try it in my hammock with my new 25 degree underquilt. Was STILL cold from the bottom. As much as I love my hammock I’m not convinced I’ll ever be comfortable in it below about 45 degrees. However, despite the cold, getting to watch the sunset from Siler Bald was worth it. A couple weeks later, I decided to do something marginally insane and head out on the coldest night of the season so far for an overnight from Deep Gap to Dicks Creek Gap. Even more silly was the fact that my hiking buddy and I started out at 10pm from Deep Gap. It was about 22 degrees when we started and was around 16 when we set up camp. I took my tent and new 12 degree down bag. I was cold for the first hour or so after lying down but eventually warmed and was able to sleep through the night. 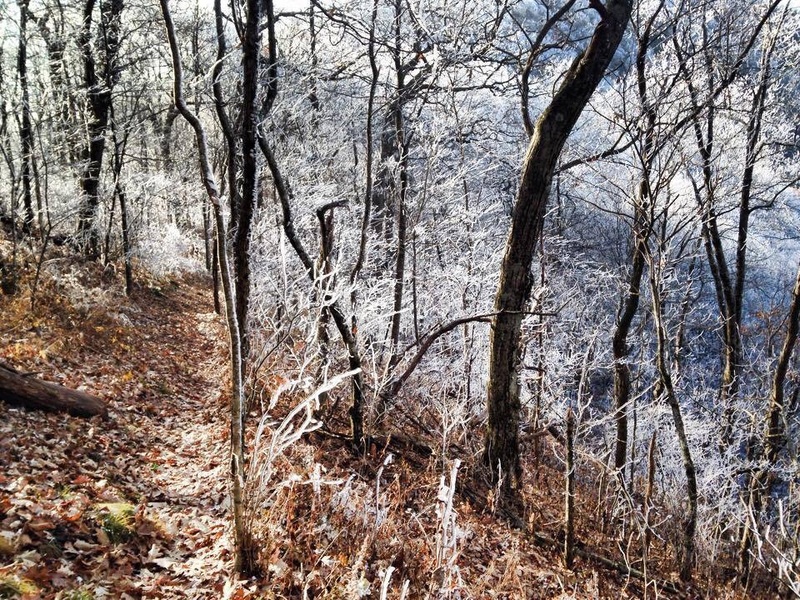 Ice on trees on the shady side of the mountain. This section included my first state line crossing! Although it really wasn’t super exciting, since I haven’t finished all of either state. Howver, it was still neat to cross over into another state on the trail. 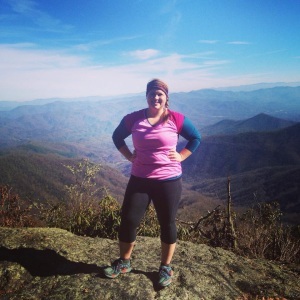 The following weekend I completed Tellico Gap south to Wayah Bald. This marked a total of 60 trail miles under my belt, in one continuous section. 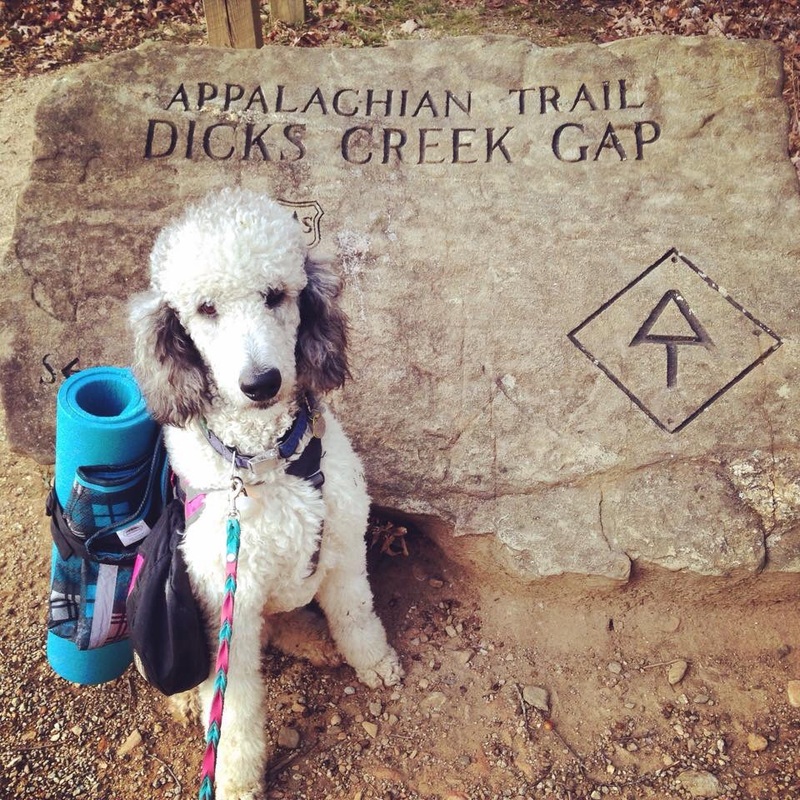 I’ve done Dicks Creek Gap to Tellico Gap. Shooter has done 36 of those with me and Sookie has done about 25. I’ve met some really cool people along the way, including “Dr. Brighteyes”, “4Be”, “Harpoon”, and a super awesome lady who’s trail name I don’t know but who thru hiked in 1996 and has completed the entire PCT and much of the CDT as well. The trail is an entity of its own, creating and fostering relationships, healing and soothing the human spirit, and giving so much more than we can ever give back. I can’t wait to see what else it holds for me and start my real adventure next May! A bit of s scramble, but the views from Rocky Bald are totally worth the short side trip.